Aramaic: Where Did it Come From, and Will it Survive? If you don’t know much about languages of the Middle East, chances are the first time you heard of Aramaic was when a certain actor decided to make a film about Jesus. What became known to many as the language that Jesus spoke is much more complex than its portrayal in that particular film. For starters, Aramaic is actually comprised of many dialects, some of which are extremely different from each other. The Aramaic that Jesus supposedly spoke was only one of these dialects. 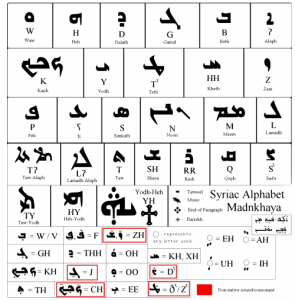 Both the Arabic and Hebrew alphabets are based on Aramaic script, so you can see just how influential it was, and still is, to the languages of the Middle East and Western Asia. At one point, Aramaic was even the lingua franca of the Fertile Crescent. The native speakers of Aramaic were known as Arameans, and settled in an area around 3500 BC where modern-day Syria is. The area was then known as Aram, and is considered by linguists to be the hub and home of Aramaic. The Arameans later began to move to other areas, namely Mesopotamia, both voluntarily and involuntarily. Along with their belongings, they took the Aramaic language and alphabet with them when they left. As it spread it became more varied, thus the different dialects still around today. The main division is between dialects found on either side of the Euphrates River. The dialects can also be categorized based on time period, falling under either Old, Middle, or Modern Aramaic. Around 500 BC, after Darius I conquered Mesopotamia, the Aramaic of that region and time period became the official language used by different regions of the empire to communicate with each other. By the 3rd century BCE, the Aramaic spoken in modern-day Syria and Egypt was largely replaced by Greek. Biblical Aramaic probably didn’t even exist until sometime between the 2nd and 6th centuries BCE, and the dialect that Jesus is believed to have used to speak with his disciples was probably a Galilean dialect spoken by those who lived in the communities where he spent a lot of his time. Today, some form of Modern Aramaic is spoken by over 400,000 people in communities in the Middle East and throughout the world thanks to emigration. Modern Aramaic is generally divided into Christian, Jewish, and Mandean categories, and the Syriac dialect is used as the liturgical language in many churches of Eastern Christianity. Western Neo-Aramaic, a dialect of Modern Aramaic, is still spoken today in three villages in Syria: Ma’loula, Jubb’adin, and Bakh’a. However, this particular dialect, among others, is in danger of extinction, mainly because the people who speak it are in danger of disappearing. Despite the Syrian government’s efforts to encourage people to learn Aramaic as a way of keeping it alive, the Aramaic spoken in Syria is getting closer and closer each day to disappearing altogether. As the economy changes and work gets harder and harder to find, the younger people who still live in Aramaic-speaking villages end up moving away from home to look for work in Syria’s cities. Of course, the main language spoken in the rest of Syria is Arabic, so in order to survive, villagers have to use Arabic and end up setting their native Aramaic aside. Since this is happening with the younger generations, those that stay in the few villages where Aramaic is still spoken end up growing old with less young people to pass their legacy on to in the form of language. Another huge factor in the survival of Aramaic in Syria (and everywhere else it’s spoken really) is the fact that Aramaic is spoken by minority Christian communities there. Some of the few Christian villages don’t even speak Aramaic as a community, but use it only as a liturgical language. Many of these communities are members of the Syriac Orthodox Church, which throughout its existence has been oppressed by various empires. Even in modern times, starting in 1895, massacres and all out genocide of Syrian Christians caused a huge decrease in the community’s population. Oppression, discrimination, and hatred are things all Syrian Christians are very familiar with. Since only 10% of Syria’s population is Christian, Christians are considered a minority, making them a target for religious extremists like ISIS. The Syrian government does promise religious freedom in its constitution, and the constitution states that there must be separation of church and state. The current president does belong to a minority Muslim community, meaning that he and the Christian community have that in common, but over the course of the current conflict in Syria there have been some Christians who have sided with the opposition. However, the issue is not whether the current government in Syria supports religious freedom or not. It does support it, but one of the major players trying to take down the government is ISIS. No matter what side they say they are on in this conflict, Syrian Christians are a target for ISIS because they are not part of their plan, which is already in progress with many major cities under ISIS control, to form a new caliphate in both Iraq and Syria. Of course, this is just based on the territory they have captured up until now. In areas under ISIS control, Christians may either have to pay a tax for being Christian, convert to Islam, or probably be punished in some way or even killed. Since ISIS is an organization with a philosophy based on an extremist interpretation of Islam, it’s pretty clear that Syriac Christians don’t have a place in the new state ISIS is creating, much less a say in what happens to them. The surviving Aramaic dialects are intrinsically linked to the sects of Christianity practiced in Syria. As you can probably see, with the current conflict, all of the Christian communities in Syria are under attack. The armed forces of the government that is supposed to protect their freedom to practice Christianity and speak Aramaic can’t defend all of the villages where Christians live. They have had to form their own army, purely to defend their own homes and communities. This force is called the Syriac Military Council, Syriac being a dialect of Aramaic spoken in the eastern part of Ancient Greater Syria. The fact that this was the name chosen for the group intended to defend these communities speaks volumes about the importance of Aramaic to Syrian Christians. 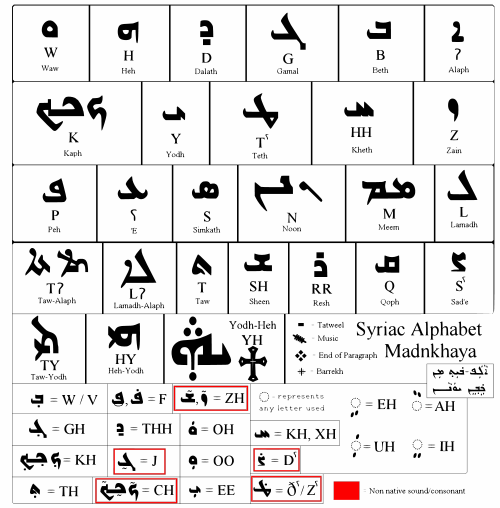 On a bit of a sidenote, Syriac was (and still is) an extremely important dialect of Aramaic. Since it was the lingua franca of the Fertile Crescent at one time in history, many writers and scholars at the time translated Greek texts into Syriac so that anyone in the area could read them. During the Golden Age of the Fertile Crescent, from the 5th to the 9th centuries, so much was written about in Syriac that it’s almost impossible to name all of the topics. Suffice it to say that anything anyone was interested in learning about in that time period was written about in Syriac. If it weren’t for those translators and writers, the Middle East would not be what it is today. That’s something that members of ISIS and other groups who are targeting Syrian Christians seem to be conveniently overlooking or forgetting as they attack peaceful villages and strive to oppress the descendants of those who provided their ancestors with so much knowledge. What has happened in the village of Ma’loula is a perfect example of how this conflict has impacted Christian communities in Syria. One of the few place where Western Aramaic is still alive and actually spoken, Ma’loula was captured by forces opposing the government back in October of 2013, was then liberated by the Syrian government, and then was captured yet a gain by the same forces. Orthodox Christian nuns were held captive that time, but were eventually freed. This is what is happening in other villages too, where Aramaic is not even an everyday language but one spoken by priests. It wouldn’t be entirely unreasonable to speculate that, in order to survive, some Syrian Christians may try to do as much as possible to hide their true identities, which would include the language of their people and religion. Just like many other languages, Aramaic is something that the people who make up the Syrian Christian community see as part of their identity and keeps them linked to their community no matter where they are. As long as they feel free to speak the language that they spoke with their family and friends growing up, Syrian Christians and other speakers of Aramaic can keep it from dying out. Every time a native speaker of Aramaic, or even one who only hears it in church, is threatened, Aramaic is threatened in turn. Even if ISIS doesn’t succeed in eradicating every single Christian in the territory it claims, the number of speakers today is so small that Aramaic is in danger of dying out. The two main reasons for this are genocide and emigration, and many times the emigration is spurred by fear of religious intolerance. If the world were a more tolerant place, we probably wouldn’t have to witness the deaths of languages such as Aramaic in our lifetimes, or ever. For an overview of our translation expertise, visit our media and marketing translation page.